Holy Cross Lutheran Church, Bismarck, North Dakota is a congregation of the Lutheran Church-Missouri Synod (LCMS) located in North Bismarck on Hwy 1804 between US-83 and North Washington. 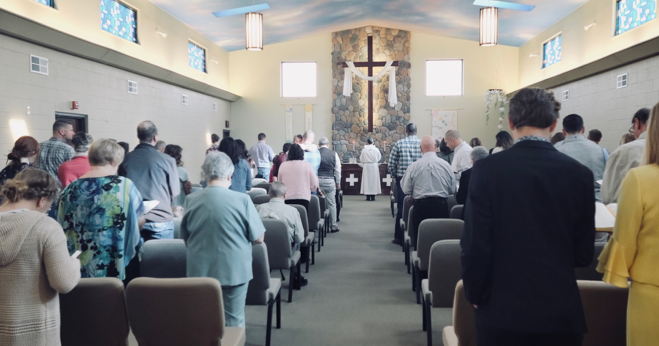 Our congregation is Lutheran in theology, small in size, with an informal, positive atmosphere. Our worship service is biblical, reverent and spiritually meaningful. As far as I know, we’re the only church north of I-94 without screens or a praise band and we sing old hymns. If you’re looking for a church home in Bismarck, or for a quality, biblical Sunday School for your children, or wish to know more about the Gospel, please join us for worship, stop by for a visit, or give me a call.